Spring is a wonderful time to be in construction, but it also means that you have less time for promoting your company on social media. 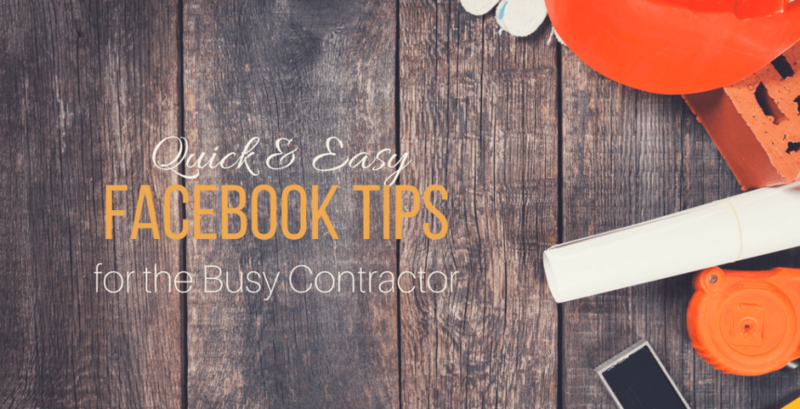 If you find yourself struggling to “do” social media because of time constraints, here are a few Facebook tips for the busy contractor. Facebook Tip #1: Schedule your posts ahead of time. Scheduling a few posts ahead of time for each day ensures that you have a consistent social media presence. 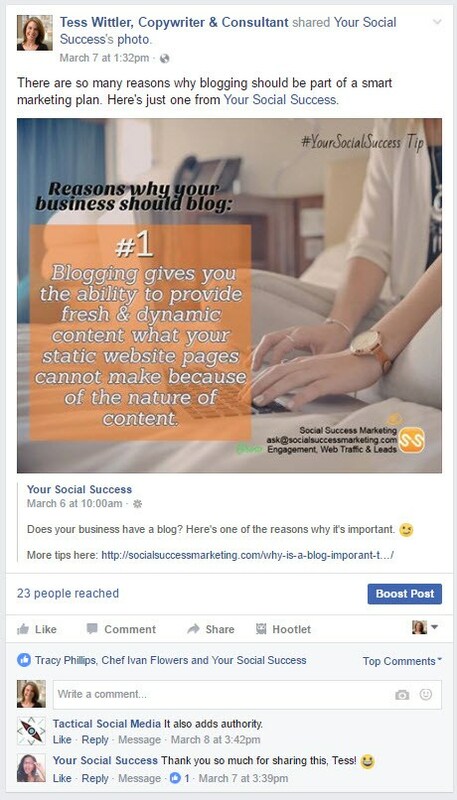 To do this, from your business page, begin by writing a post. Instead of clicking “Publish,” click the down arrow beside “Publish” to get the “Schedule” option. BONUS Facebook Tip: Another option is to use a scheduling tool like Buffer, Hootsuite, CoSchedule or Postcron. I personally use CoSchedule (affiliate link). Facebook Tip #2: Don’t Post-N-Go. To gain more traction (i.e., ROI) with your social media, you actually have to BE SOCIAL. This means getting rid of the “post and go” mentality and interacting with your audience. Pick a couple times a day (morning and evening, for example) to monitor your posts and interact with those who comment. Here’s an example of what I mean. In the post below, I interacted with everyone with a combination of “likes” and comments, and as such, people see me as personable, responsive and human. Facebook Tip Take-Away: When you begin a conversation, the result is the start of a meaningful connection online. While this does takes more time, keep this in mind: You’d respond to someone’s comment in person, so do so on social media. If someone comments on your post, say thank you. If someone shares your post, be sure to give them a big “thumbs-up like” on their post. Facebook Tip Take-Away: A little courtesy is always appreciated and noted on social media. Facebook Tip #3: Tag others. Make sure you tag other businesses on your posts, where appropriate. Here’s how: 1) When you decide where you want the tag to be in your post, type in the “@” sign and follow it by typing the business or person’s name. 2) This will generate a drop-down list of pages that start with those letters you’ve typed. Facebook Tip Take-Away: Not only is tagging other businesses courteous, but it also notifies them that they were tagged – potentially growing BOTH of your reaches. Facebook Tip #4: Try Facebook Live. Being busy on a job site is a great time to stream live on Facebook Live. It generates excitement for your audience and gives people a “behind the scenes” look at what you do. 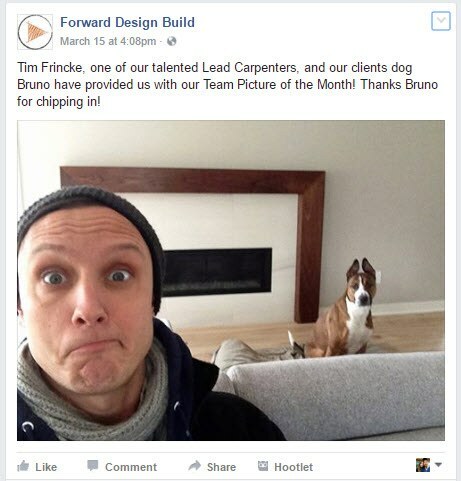 Not only is it fun and interactive, but Facebook is giving priority to video content! ​BONUS Facebook Tip: If you aren’t feeling confident with Facebook Live just yet, record a video using your cellphone and then upload it directly to Facebook. This will help you become more comfortable in front of the camera … and then when you are ready, you can take on Facebook Live. Facebook Tip #5: Be generous with sharing. If you see something interesting happening at a job, share it – even if it isn’t by your crew. For example, if you see a tile layer making amazing “art” with the detail he’s creating in a walk-in shower, take a photo (or a video) and share it on your Facebook page. Make sure you tag the contractor (see Tip #3), too. Remember, what comes around goes around. Facebook Tip Take-Away: When you are generous with your social media posting, over time others are bound to return the generosity. Facebook Tip #6: Get a little personal. People love, love, love to see snippets of the humans behind the business. Remember, people do business with other people, not logos. Some ideas include: a picture of you stopping to grab a coffee from a local business before heading to a jobsite, or a photo of employees. BONUS Facebook Tip: If you are looking for some creative ideas, spend some time looking at other Facebook pages. Some of the best ideas are derived from those you see other people doing … and make it your own. Facebook Tip #7: Use the official hashtags. If you are attending a conference or event, use the official hashtag. Hashtags are searchable and help a bigger audience – many who you may not know – connect with each other. Plus, it is fun to interact with others during big events! ​Facebook Tip Take-Away: Hashtags are a great way to meet new people that you’d otherwise never be able to meet. This is especially true on Twitter. I really like some of these ideas, especially the one about getting a little more personal. I wish every small business did more of that! I think for some businesses, it is hard to figure out WHAT to get personal with. I hope to share more ideas in that area in the coming months. As always, I appreciate your support and comments. Great tips Tess. I love the idea of being more personal. It’s all about relationships and connecting. Absolutely! That is getting more important, too. As businesses automate social media, those personal touches really got a long way to forming a connection. Thanks for chiming in, Robert! I have something to add to the list — lately I’ve been using extensions like Adblock and Facebook Purity to customize my feeds on my social media. I find it works best to “do” social media from within the native clients (rather than something like Hootsuite), but I can get very distracted very quickly by thinks like trending topics (which are rarely appropriate for a brand to jump on). So I turn off the things that distract me, allowing me to focus on the reason I’m there — the people who are interacting with me or my brand. Thanks for the list Tess — great ideas! Using extensions to help minimize distractions is a really good tip, Adam. Thanks!